Glendinning Way, Madeley, Telford, Shropshire. SITUATED IN A CHOICE LOCATION: A four bedroom detached family home which would benefit from some modernisation. Through Entrance Hallway, Cloakroom/WC, Living Room, Dining Room, Breakfast Kitchen, Utility Room, 4 Bedrooms, En-Suite Shower Room, Family Bathroom, Double Garage, Double Width Driveway, Front & Rear Gardens, EPC Rating B. A front canopy and door gives access to the through entrance hallway which has a staircase ascending to the first floor, access to cloakroom/wc, living room and breakfast kitchen. The living room has an outlook towards the front and double opening door leading to the dining room which has a door leading to the breakfast kitchen and sliding patio doors leading to the rear garden. The breakfast kitchen has a range of base and wall units, space for cooker, door to utility room and a pleasant outlook towards the rear garden. The Utility room has a base unit with inset sink, space for washing machine, integral door leading to the garage and external door leading to the rear garden. 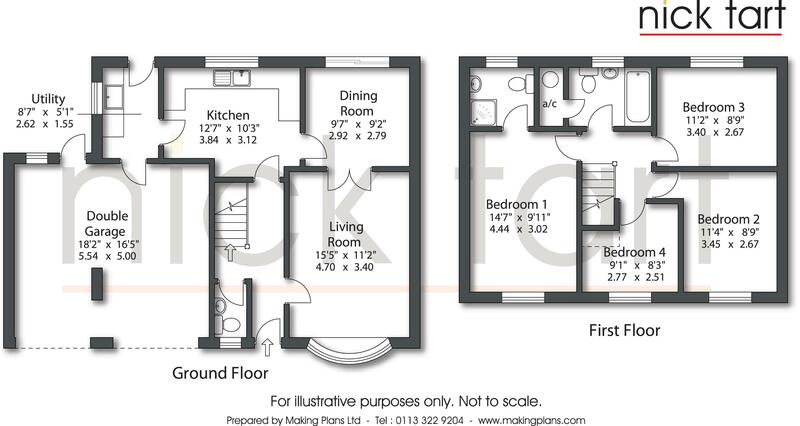 On the first floor there is a landing with access to four bedrooms and family bathroom/wc. The master bedroom has the benefit of an en-suite shower room. The family bathroom/wc has suite comprising the usual facilities and an airing cupboard with slatted shelving and housing the property’s hot water cylinder. To the front of the property there is a double width block paved driveway providing off road parking and giving access to the double garage. Gated access leads to the rear garden where there is a paved patio area and a laid lawn with a number of inset shrubs and trees. How to get there – for sat nav use postcode TF7 5TB.